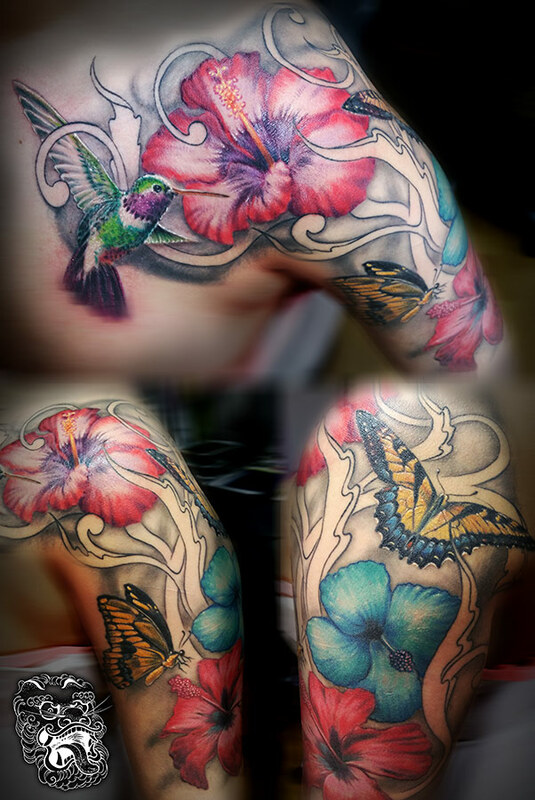 Floral tattoos — Malan - Top Realism Tattoo Artist working from Germany, Neuwied. Women love flowers and flowers were always around them. No surprise then, that women are usually the ones that get floral tattoos. Flowers are colorful, can be placed on the body to create flowing compositions. Easy to join with butterflies, animals, moths, and birds. But as the world becomes more open-minded, and we are free to express ourselves without prejudgment, men started to get flower tattoos too. Flowers are great for covering old, unwanted tattoos. Organic elements are always great for that purpose, as it is much easier to adjust their shapes depending on the cover-up need. In this tattoo, I covered two unwanted designs and created one, contemporary tattoo image. 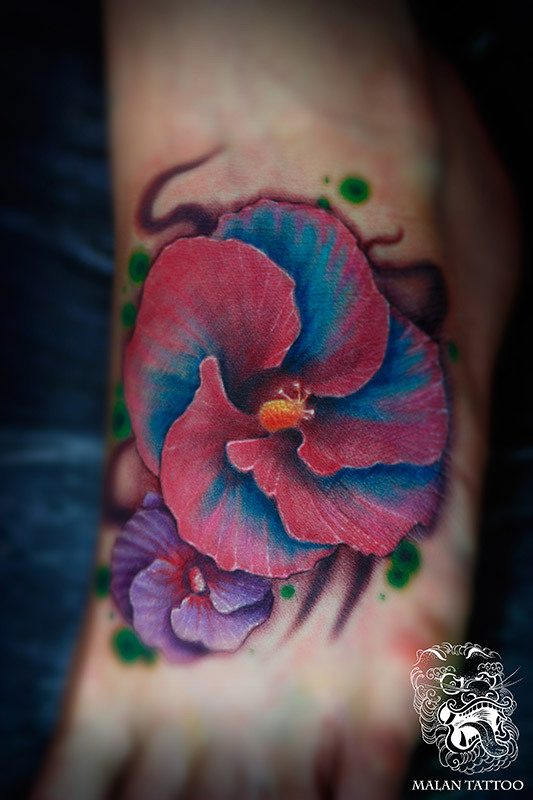 Flower tattoo on the foot. In this case we used some tropical flower as a reference. Flowers are great for creating flow and rthm. Are the most popular flowers for tattooing. Probably everyone has some memory related to rose. First date, someone who passed away, or another special moment, a rose is traditional to tattoo because it can hold so many different meanings, depending who is getting it. Rose tattoo here was made of newspaper from the day family relative passed away. 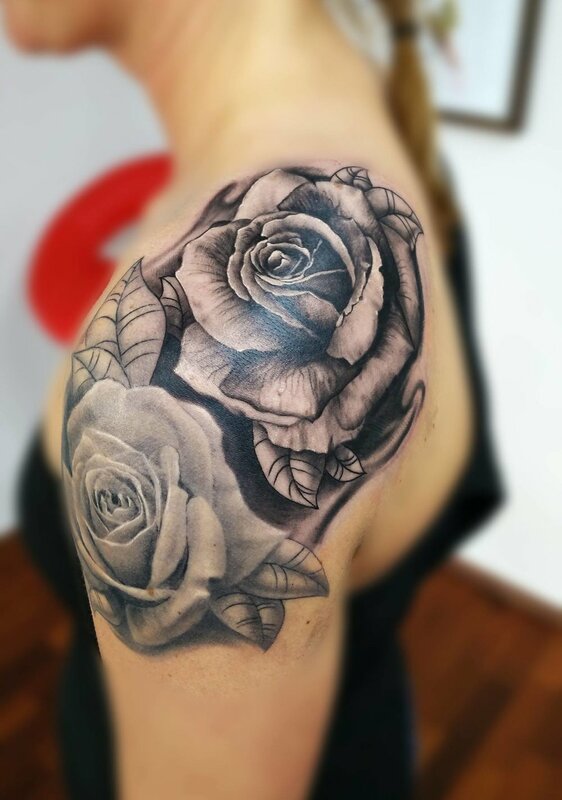 Rose tattoos with a bit transition between traditional and realism. While doing a realistic rose tattoo is pretty strict, all the complementing elements (thorns, leaves, additional petals, vines) give a lot of the creative freedom. In this case, my task was not only to make the rose look better but also to change design into a more masculine one. I decided to go for a snake, that will use the flow of the body, but at the same time will add a bit of power to the tattoo.